Note the deep tan on my arms that did not make it to my face. Revel in my huge glasses. Mock the hair that took an hour (or more) to curl and style… though that’s my natural hair color… Check out the incredibly posed elbow on the piano. 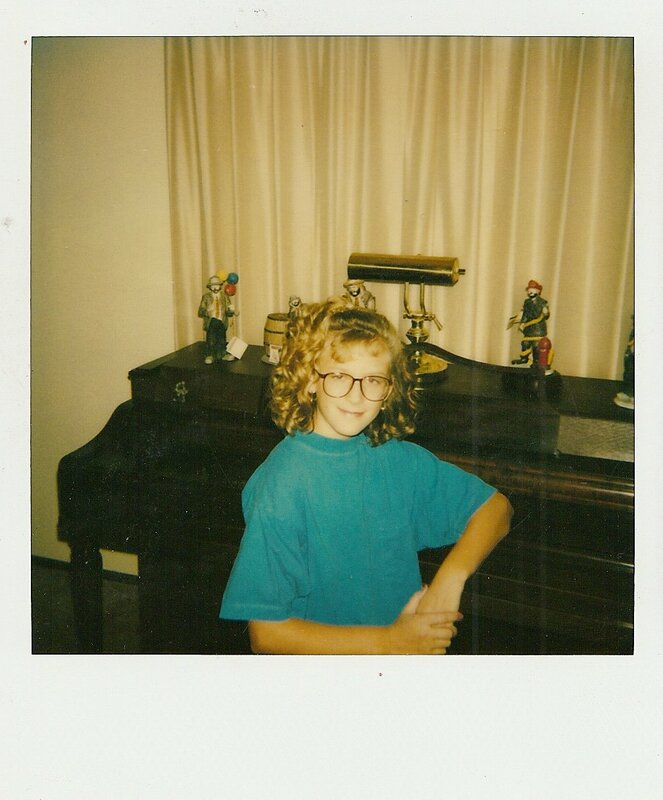 Make sure to remember that Cami does not play the piano… oh yes… I was a big ol dork! But I’ve moved on… I’m past that… because Wednesday (that’s today for those of you who read promptly) I’ll at the very least be where the cool kids are. It’s a big event day here in Portland and I’ll be on top of things. First by heading over to cube space for the Silicon Florist Lunch 2.0 and Birthday Extravaganza where Rick Turoczy is going to be hosting a ton of people for the ever popular lunch sensation. What will we do? What will we talk about? Who will be there? Who knows, but it’s sure to be a lovely time. Then after a little time to rest and regroup I’ll head over to Urban Grind NE for Back Fence PDX, an amazing evening of story telling hosted by Melissa Lion & Frayn Masters (The Back Fence Babes). Then… well then the very best thing of all… then I will head to the most exclusive party in all of Portland, a sleepover at my house. I only invited one person, the coolest guy I know. Boy I’m sure hoping Dr. Normal can make it. Have a great Wednesday everybody, I think I will! Very timely post. MG starts High School today, and it was nice to be able to show her a picture of my “dork” cousin when she was her age.Have fun today! I thought you were the coolest person I knew back in those days. I still do. Also, I would like to note that you throw the coolest slumber parties ever. I remember many a night involving makeup exchanges, the Rocky Horror Picture Show, and throwing TP at the television. Your parents must have loved us. I’m very jealous of Dr. Normal right now. The former dorky kids are taking over. Being lame in junior high is the source of all creativity. See you twice today. How lucky am I? caseorganic: I wonder if anyone liked the way they looked then… See you at lunch!Mie: Golly they start early, glad I could helpthebeerbitch: We need another slumber party girlie. we really do. pesky miles.melissa: see you there and then there. That girl looks eerily like a grown up K!!!!!!! Whoops – hit send to soon…You looked like a cute dork – and part of that look was the time, too. Still – cute! Ahhh you were so cute. 13 is such a weird age isn’t it? Part little kid part grown up girl. I think all people are slightly dorky at 13, but you were beautiful dork. :DHope the sleepover went well too. I’m catching up. I’ve missed my Cami. greeeat pose…nicely struck!madonna would totally love you for this. both for the pose-striking and the self-expressing. SWEET!The glasses… in them I revel.